Approaching perfumery from a fine art context, this blog describes how scent is a viable means of communication. I will always consider visual aesthetics when designing perfume exhibitions for two reasons: Scent only translates into an experience when an audience is present within a space, therefore visual aesthetics become a useful means of describing and promoting my olfactive endeavours when removed from the space itself. Secondly, visual aesthetics allow perfumery to be placed within different contexts, therefore extending our relationship both with perfumery as a craft and scent as a means of communication. More recent Perfume as Practice exhibitions have seen me design a convergence between what is seen and what is smelled; using perfume and painting to explore and re-contextualise the effects and possibilities of scent as communication. Given this, it might come as no surprise that the bottle in which the perfume is housed becomes an item of great importance – it is the key apparatus that uses it’s aesthetics to describe the concepts within an exhibition, and is also the gateway to interaction with the scent itself. 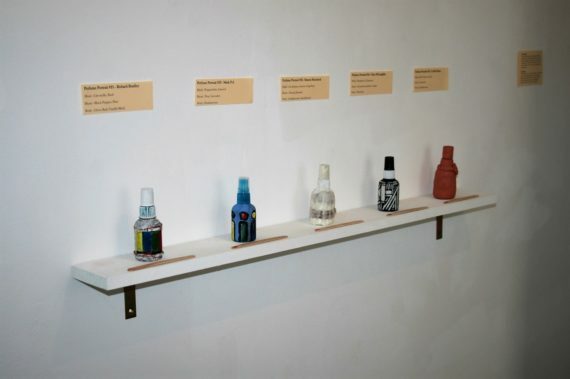 I afford a lot of consideration choosing bottles for exhibitions as I want to design a coherent and meaningful experience, therefore everything must be correct. I am aware of how the perception of a fragrance can shift due to the visual information you can receive from the bottle: A perfume in a conventional spritzer possesses an entirely different meaning to the same perfume placed in a medicine bottle, for example. There is an interesting discourse here regarding how our visual relationship with the world informs our olfactive sensibilities – and this is something that can be revealed, subverted and challenged by placing perfumery within a contemporary art platform. And of course, certain bottles contain a history and a narrative of their own, whether they contain perfume or not. 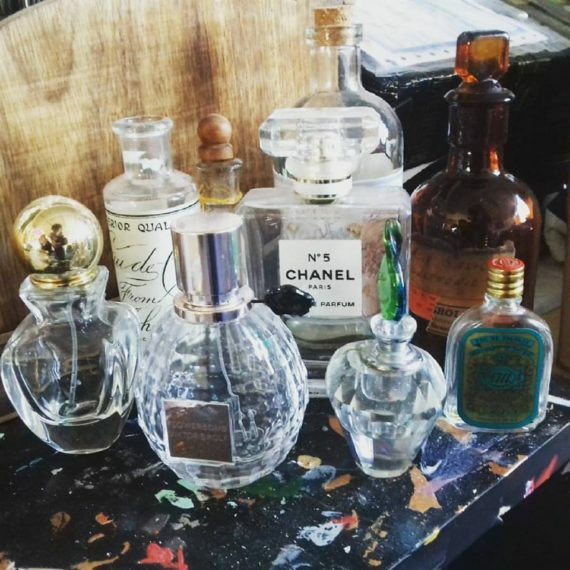 I’ve taken to collecting bottles; nominally as a source of inspiration – a reminder of the possibilities they possess. But also, I just kind of like them! 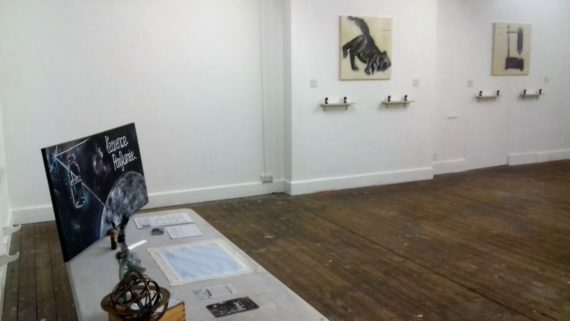 Last Saturday I visited the venue for my next Perfume as Practice solo exhibition – Bureau Gallery in Blackburn. As with any space, Bureau Blackburn comes with its own set of quirks, nuances and challenges. 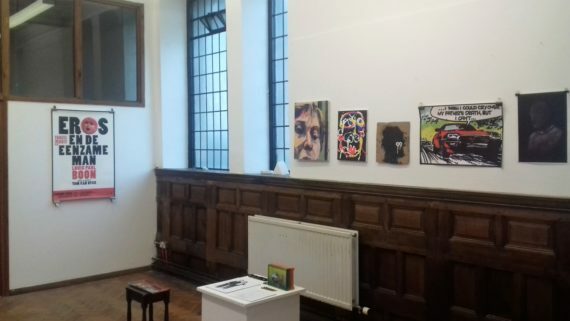 Chiefly, the space is a former Church, and as I strive to place my Perfume as Practice exhibitions under specific themes, I must question whether I should respond to the aesthetics of the venue and position the perfumes under some kind of religious theme. Religion could certainly be utilised effectively as a theme, with a lot of possibilities and avenues to explore. There is something intangible yet profound about religion, and that shares parallels with the conceptual possibilities of perfumery: Placing perfume and religion beside each other may well inform, reinforce and extend our relationship with both. fragrance and religion also share historical connections and narratives; particularly around rituals, sacrificial offerings and the use of incense. Again, I need to address whether there is any viability in exploring such connections within my exhibition. So my visit gave me a lot to think about! No doubt I’ll spend the next week or so thinking things through in order to arrive at answers to the questions posed. It is becoming clear that April is going to be a rather busy month. It will see me host 3 perfume making workshops, an artist’s talk and, predominantly, my first Perfume as Practice solo show of the year – Perfume as Practice SS18 at Bureau Gallery, Blackburn. 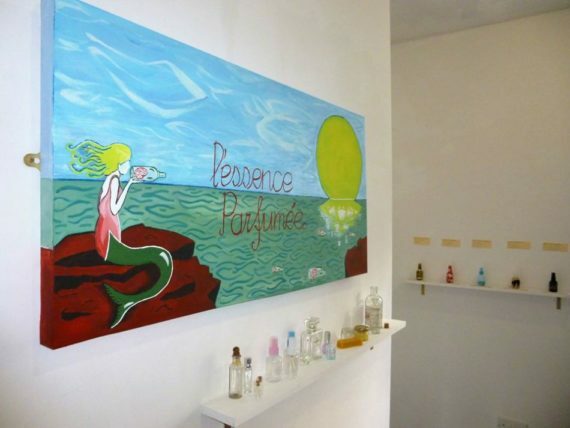 My most recent exhibition at Surface Gallery housed 20 perfumes in a space about 5 times larger than my first show. This was a good amount as the audience could exist within the space without getting overloaded by fragrance. There are other variables, of course, to the ways in which scent exists within a space; other considerations include how large the bottles are, exactly how an audience interacts with the fragrance and whether the perfume is alcohol or oil based. These considerations will all be factored in to my assessment of the space on Saturday to ensure a composed experience for my audience. There is a degree of coyness to April’s barrage of creative activity as I’m conscious of taking too much on. But I’m confident that the quality of my work will not suffer. So let’s just get on with it! Let the Funding Process begin! I find myself in a rather unusual yet advantageous position of having all of my fragrance based endeavours for the next 12 months secured. The only anomaly to this is ‘Scents of our Time’ – which I’d like to trial somewhere before the year is out. This means that attention has turned to two things – securing opportunities for 2019 and, more pertinently, securing funding for this year. My experience with funding is a little turbulent but also somewhat underdeveloped – I haven’t attempted many funding applications but, more recently, the ones I have attempted have been successful. This gives me confidence going forward, for sure, and it does reinforce the viability of my position as a fine art perfumer. That said, it might be useful to evaluate the reasons why I have received some successful funding in order to inform future applications. This year, I am looking to secure funding for two solo shows, a two-man show and two group shows I have initiated; one of which is international. My first action, then, should be to assess which bodies of funding are relevant to each activity and then just get on with it. I have a tendency to deliberate for ages before I actually begin an application. Chiefly I probably overthink how to frame my endeavours as something visual, as is necessary for applications specific to visual arts. My argument is that, to an extent, perfume is a visual activity. I am also aware that I have a tendency to be a little too flowery in my use of language (as anyone who reads this blog regularly no doubt knows already!) and this of course has an adverse effect on funding applications, where often you have to be clear and concise. This is something I’m much better at that I was, say, 12 months ago though. And the fact that I’m aware of it means I can anticipate it and act accordingly during the funding process. So a rather administrative start to the new year then! But with my first solo show of the year only a few months off, I expect that to change very soon. 2018 – The Year of Collaboration? Well that was the year that was 2017. A fantastic fragrant adventure, all told, but to be honest the business of securing exhibitions, holding workshops and sourcing opportunities mean that the years sort of blur into one; a fair chunk of my 2018 diary is filled already and I’m contemplating finding a 2019 one. That said, as I look to the next 12 months there is one thing I want to address – the extension of my knowledge of perfumery. You see, although 2017 proved fruitful in terms of the exhibition and workshop opportunities presented to me, the sheer workload saw me instigate no tangible further research into perfume as a mode of communication. I’m keen to learn more about the historical, social and political capabilities of scent in order to accomplish richer, more coherent work. This can be achieved in many ways, including more formal and scholarly research into the subject. But principally this year I wish to let other artists into my perfume making process, initiating collaborations that will be mutually beneficial; seeing not only an exchange of knowledge but a means of furthering our collective understanding of scent and what scent can be. It’s certainly something I’m looking forward to, although it may well reveal some of my own shortcomings. After all, I’ve only really been making perfumes for a few years and my comparative lack of knowledge may come with it’s own set of problems. But hey, I’m here to learn, and learn I shall! A contemporary artist from Sheffield. The main body of my work, entitled Perfume as Practice, sees me utilising the capacity fragrance has for contemporary art gains. Studio at Yorkshire Artspace.